Shrady, George F. “The Probable Course of the Ball in President McKinley’s Case.” Medical Record 14 Sept. 1901 v60n11: pp. 422-23. The illustrations are inserted below within the text in accordance with the original source (which was formatted in two columns). This has resulted in figures 2 and 3 appearing out of sequence below. 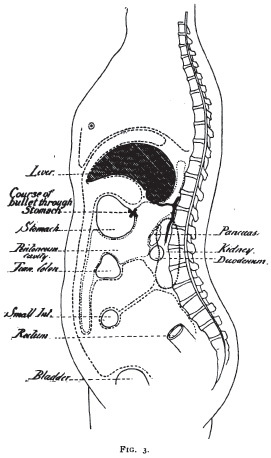 IN view of the great professional interest in the case of President McKinley, and in the absence, up to the present writing, of any definite demonstration of the exact course of the bullet, the MEDICAL RECORD presents a study of probabilities which, from anatomical and surgical standpoints, may prove interesting to our readers. The accompanying illustrations have been made with great care, and with special reference to their particular adaptability to the purposes of the article. Figs. 1 and 2 indicate the points of entrance of the missile from the front, and Fig. 3 shows, in a schematic way, the relation of the important internal organs in an anteroposterior section of the trunk. to the direction of the ball, as the latter has not been traced beyond its point of exit from the posterior wall of the stomach. Nor can any positive information be obtained as to the relative positions of the would-be assassin and his victim. It was evidently intended that the pistol should be fired point blank, the parties nearly facing each other, and that the heart should be struck. In the absence of any proof to the contrary, it must be assumed that the aim was really in a direction from before backward, slightly to the left, and on a horizontal plane. In the present aspect of the case, considering the important organs in the region of the wound tract, the great wonder is that so many of them escaped mortal injury. The opinion of the surgeons in attendance on the President is to the effect that the foreign body is lodged in the muscles of the back somewhere in the region of the eleventh intercostal space and possibly in the substance of erector spinæ muscles. This would give the ball almost a horizontal direction from before backward. It is impossible to believe that it took a more internal course toward the vertebral column, as the cœliac axis  or even the aorta itself would undoubtedly have been wounded. 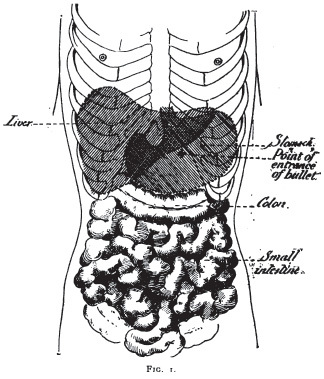 It has been quite clearly demonstrated by the operation that the stomach was the only important organ injured. The left edge of the liver escaped harm by the merest chance of its position and thus a most formidable if not a fatal complication was averted. There was no injury to the adjacent cartilage of the eighth rib. In placing the point of exit of the ball on a line with that of its entrance as in Fig. 2, the relative positions of the internal organs in the neighborhood can be easily studied. The only apparent reason why all these important parts escaped injury is on the supposition that the real course of the missile is thus properly placed in the diagram mentioned. Toward the median line are the important blood vessels already named. 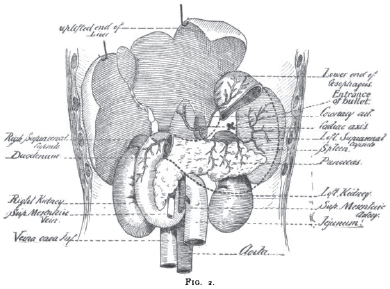 Inferiorly are the splenic vein and artery, the pancreas, and the left suprarenal capsule and kidney, and posteriorly and externally the spleen. The only point for the safe transit of a bullet would be seemingly in a very limited space within these boundaries. course, considering the proximity of important blood vessels, would have been extremely hazardous. Considering also the necessity of shortening the period of shock as much as possible, there was no time for deliberate dissection or prolonged search. Besides it is quite usual under the circumstances for the course of a ball to be lost when it is continued through the loose areolar and fatty tissue usually found in the neighborhood of the parts involved in the operation. It was not impossible for the missile after its escape through the posterior wall of the stomach to drop into the peritoneal cavity. If such had been the case, however, the ball would have been easily found by the surgeons during their careful toilet of the peritoneum. If by any chance the ball had escaped detection in that situation there would have been a very prompt clinical evidence of the fact. If the ball be actually lodged in the muscles of the back it could not be more favorably situated for fulfilling the conditions of encystment nor be more out of the way for resisting the effects of ordinary pressure irritation.